There’s a 3-day conference this weekend in Toronto that will bring together the disability community. Its theme this year is Intermingling Disability Communities. I will be there on the Friday to cover what’s happening! The Reclaiming Our Bodies & Minds Conference was initially hosted at Ryerson University in 2012. 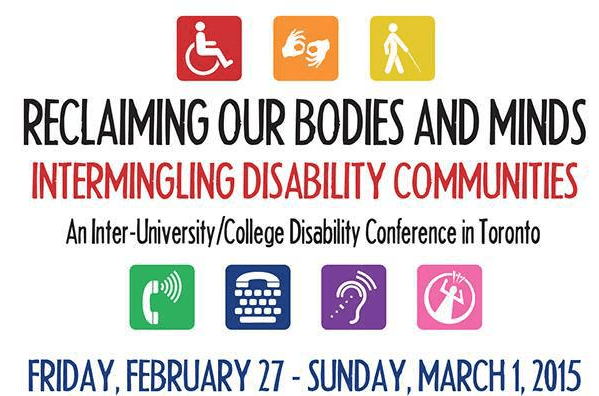 In 2014, student groups and campus/community activists from Ryerson University, York University, University of Toronto and George Brown College came together to imagine an inter-campus conference that brought together disability community activists, service providers, academics, and everybody in between. This is the first year of the Reclaiming Our Bodies & Minds Inter-University Conference. You can find the conference schedule here.